David Smith, chief financial officer and director at Rolls Royce, will join U.K.-based science and engineering company Qinetiq as CFO. 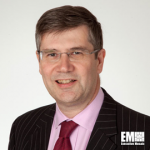 Qinetiq said Tuesday Smith will succeed David Mellors, who is scheduled to leave QinetiQ on Dec. 31 to join Cobham as the defense contractor’s CFO. “[David] has extensive executive experience in blue chip companies and I am confident that he will make a significant contribution to delivering sustainable growth at QinetiQ, ” said QinetiQ CEO Steve Wadey. David Smith previously worked at technology group Edwards as CFO and at Jaguar Land Rover as CEO. He has also held senior finance roles at Ford and served as a non-executive director of Motability Operations Group.